At The Heathman Lodge, we’ve worked hard to create a culture of service that’s genuine, and not mere lip service. 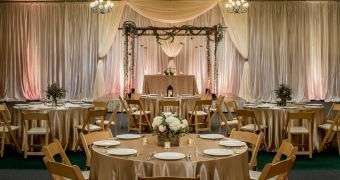 Whether you need help with a business meeting, conference, social gathering, wedding, or other events in Washington State, your event coordinator will have one goal: making sure your event at one of our venues in Vancouver, WA is a success, whether you are planning for four people or 400. All 10,000 square feet of event and venue space available here are far from the cold, sterile spaces you may have encountered elsewhere. It’s all warmed by expressions of native culture, NW artwork and distinctively crafted lighting. And, of course, a sense of earnestness and willingness to please that pervades our staff. Your personal coordinator will help plan and design your event, from exploring the big picture to the tiny minutia that makes meetings hum.